We're looking forward to helping you achieve more using less. The AYTA group has been working with our Orian team for over a year implementing the lean manufacturing principles. Tremendous progress has been made in all aspects of our business. The AYTA team members' approach has been very professional and hands on (from the floor up). They have been coaching our management team in lean principles and how to apply them and to always be in a continuous improvement mode. Great progress has been made in quality and waste reduction, uptime & throughput (via pull system), process improvements and cost reductions via Kaizen events and workshops, implementing SOP's, individual & team developments, strategic and organizational development. AYTA's team took the time to learn our business and virtually became experts in our field. They have been very respectful to our employees and have been very pleasant to work with (this is an awesome group of people). I will never regret the decision to bring them on board and our intention is definitely to keep them at Orian, as "implementing lean manufacturing" is a journey, and I want them on our side as a mentor and coach for our organization. The AYTA Group is an elite, hands on technical consulting firm that focuses on improving the economic value of products by developing, and coaching the organization’s workforce to be long term thinkers. I have worked with various consulting companies through the years and this essential element is what sets them apart from their competition. They are the leader of the pack when it comes to transitioning from a goal to actual delivery on improving a company’s bottom line. 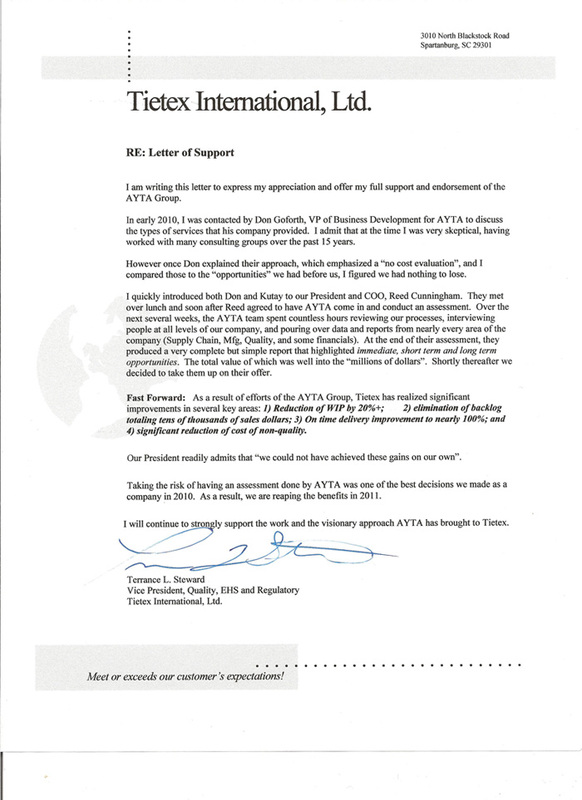 I am writing this letter to express my appreciation and offer my full support and endorsement of the AYTA Group. In early 2010, I was contacted by Don Goforth, VP of Business Development for AYTA to discuss the types of services that his company provided. I admit that at the time I was very skeptical, having worked with many consulting groups over the past 15 years. However once Don explained their approach, which emphasized a “no cost evaluation”, and I compared those to the “opportunities” we had before us, I ﬁgured we had nothing to lose. I quickly introduced both Don and Kutay to our President and COO, Reed Cunningham. They met over lunch and soon after Reed agreed to have AYTA come in and conduct an assessment. Over the next several weeks, the AYTA team spent countless hours reviewing our processes, interviewing people at all levels of our company, and pouring over data and reports from nearly every area of the company (Supply Chain, Mfg, Quality, and some financials). At the end of their assessment, they produced a very complete but simple report that highlighted immediate, short term and long term opportunities. The total value of which was well into the “millions of dollars”. Shortly thereafter we decided to take them up on their offer. significant reduction of cost of non-quality. Our President readily admits that “we could not have achieved these gains on our own”. Taking the risk of having an assessment done by AYTA was one of the best decisions we made as a company 2010. As a result, we are reaping the beneﬁts in 2011. I will continue to strongly support the work and the visionary approach AYTA has brought to Tietex. 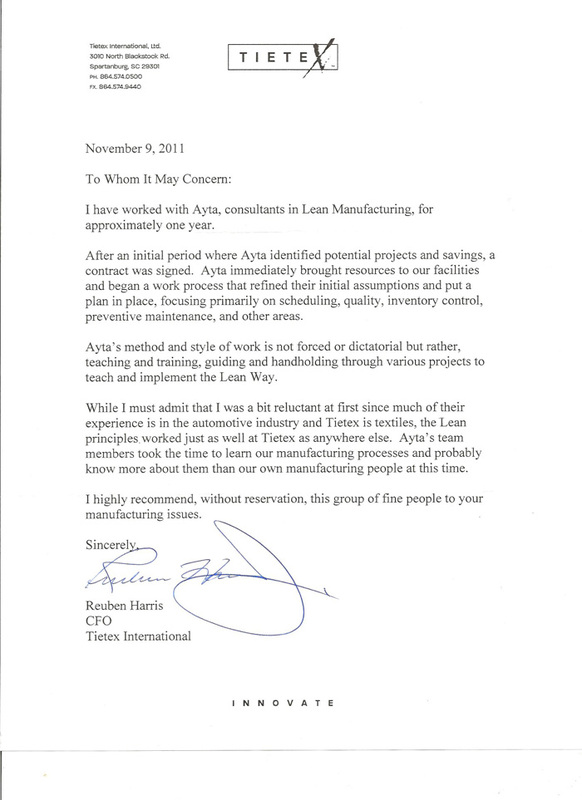 I have Worked with AYTA, consultants in Lean Manufacturing, for approximately one year. After an initial period where AYTA identiﬁed potential projects and savings, a contract was signed. AYTA immediately brought resources to our facilities and began a Work process that reﬁned their initial assumptions and put a plan in place, focusing primarily on scheduling, quality, inventory control, preventive maintenance, and other areas. AYTA’s method and style of work is not forced or dictatorial but rather, teaching and training, guiding and hand holding through various projects to teach and implement the Lean Way. While I must admit that I was a bit reluctant at ﬁrst since much of their experience is in the automotive industry and Tietex is textiles, the Lean principles worked just as Well at Tietex as anywhere else. AYTA’s team members took the time to learn our manufacturing processes and probably know more about them than our own manufacturing people at this time. I highly recommend, without reservation, this group of ﬁne people to your manufacturing issues.